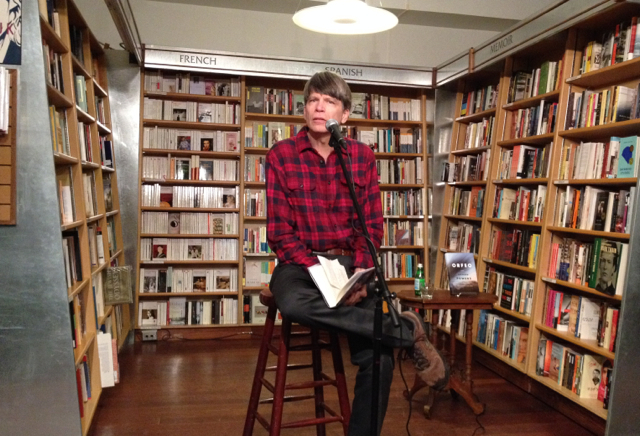 National Book Award winner Richard Powers read from his new novel, Orfeo, and discussed the book at McNally Jackson Books. The novel combines the past and present of protagonist Peter Els while relying heavily on music to propel the narrative, the third of Powers’s books to integrate music into the text. Before reading, Powers explained that he had been asked to read for approximately twenty minutes. Since the full audio recording is fourteen hours, he says, the twenty minutes represents approximately two percent of the full book. Powers has written ten other novels. Many of those deal with technology and the cerebral conflicts that come from those ideas. “I do like people more than ideas,” he assures the audience. Powers reads a passage meant to illustrate how music is integrated into the narrative. Peter Els, a composer, has just lost his dog when a piece of music triggers a moment that sends him back into his past. Neither the present nor the past dominant though, and Powers has intentionally maintained the duality to obscure the specifics of either. The novel is divided into the past and present, a back and forth dialogue between the two. After reading, he opens up to audience questions. His introduction discussing the audio book inspires a question on his perception of the medium. He says audiobooks provide a bizarre experience. The professional readers change the tempo from what he as the author imagined, and result is, to him, a disconcerting cadence. He insists that of his own books he can only listen to a few minutes of the audiobook before switching it off. The sound of the prose is important he says. The way something sounds imparts meaning. He admits he has taken to listening to audiobooks — by other people, not his own. “No one can do just one thing anymore,” he says. Taking a walk is not just taking a walk; now taking a walk is taking a walk while ‘reading’ a book. He of course revises his own prose by reading it back to himself. He would keep revising until his publisher takes away the manuscript. But primarily he listens to music. “Its the thing I know that most refreshes me,” he says. Novelists have the opportunity to dabble in many other careers under the guise of research, he says. He isn’t procrastinating when he listens to music. Its research. He says too that in his younger days he might have wanted a career in music. Powers says he knew how the book would end before he started writing. And then the book didn’t end that way. The novel came apart several times. Peter Els began as a minor character. He had three hundred pages that he trashed. But what he describes as “false leads” play an important role for him. “I know I’m guilty of a kind of impatience when I finish a manuscript,” he says. He wants it to be the final draft once he decides its finished. But, he says, “you have to put the time in to take it apart.” He means that without the commitment to mistakes and willingness to take risks and fail, the failures are never apparent. He does warn that there is a risk to over-editing. “You could easily wreck things by overworking it,” he says, but it’s also impossible to know when that moment is. He knows he is finished when he can’t think of any new alterations he wants to make. Powers says he circles obsessively around the same material in his writing. For Peter Els, the thematic interest is the intersection of time. Tension in the novel is built up through the two time periods, and the difference in how the time elapses. In one timeline, only a few days elapse throughout the novel, while in the other, the rest of Peter Els’s life unfolds. Tension arises in that the reader sees an eventuality–the present timeline–even as the past continues to evolve. Orfeo required five years, almost twice his usual pace of writing. He spent the last fifteen years living in the Champaign–Urbana, Illinois area. He describes it as a place where the world isn’t knocking on your door. It was a place for him with few distractions from writing. He has recently moved to Palo Alto, California. The appeal for the move was the combination of access to super new technology alongside the huge amounts of preserved spaces, the redwood forests and national parks. For now, he says, the biggest appeal is the trees.